Matthews Wall Anchor uses hollow bar anchors, the latest underpinning product, to improve your project’s efficiency. Our hollow bar anchors are made from micro-alloy steel tubing. They are perfect for soil nails, tie down and tieback anchors, and micropiles. Hollow bar anchors can be used for all types of soil including decomposed rocks, clay soils, loose sand, and round gravel. 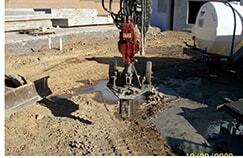 Hollow bar anchors have geotechnical features that make this product ultimately efficient and effective. These anchors come in different sizes to meet loading requirements for every project. Matthews Wall Anchor’s structural contractors use Earth Contact Products hollow bar anchors. Please visit their website at www.earthcontactproducts.com for product information. We provide free estimates! Contact Matthews Wall Anchor today!